431 BCE - Greece is torn asunder by the Pelponnesian war. Athens and Sparta are in bloody conflict, each side hiring mercenaries to do their bidding while the picturesque Aegean isles are awash with blood. A terrible time and place to be caught up in; a wonderful setting for the eleventh Assassin’s Creed. Building on the rock-solid foundations of Origins, Assassin’s Creed Odyssey doubles down on an RPG-like character progression system and introduces a deeper, more considered combat mechanic which rewards timing and studying enemy movements instead of button-bashing. As Alexios or Kassandra, a mercenary caught amidst the civil war, you’re able to choose a side and impact the world map’s political borders via missions and, for the first time in the series, large-scale battles which play out in real-time. Romance is also on the cards, with NPCs of both genders available to engage with regardless of the player-character’s gender. And, this being ancient Greece, naval combat is very much back at the fore of AssCreed’s action. What more could an ancient-era merc ask for? Sounds like something you’d be into? 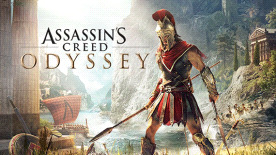 Then make sure to pick up the Assassin’s Creed Odyssey PC version from us today and get your AC Odyssey key delivered straight to your inbox in time for release!